The plane landed in Honolulu without any problems. They boarded their connecting flight to Samoa, finally beginning to relax. Three hours into the flight the pilot announced the plane had encountered some mechanical problems. The plane's landing lights were inoperable, and there were no repair facilities open in Samoa. As a result, the pilot turned the flight around and headed back to Hawaii. "We were completely dejected," Mike said. "All of our preparation came to a screeching halt … all because some light bulbs weren't working!" After the plane landed safely in Honolulu, the glum business partners entered a deserted Hawaiian terminal. But, as had happened all along, luck was once more on their side. An Air New Zealand flight that travels to Samoa only once a week "just so happened" to be at the terminal, scheduled to leave in less than 45 minutes. "We were shocked and thrilled. I've never run so fast in my life!" Alan said. They both hopped onto the flight hoping this plane's landing lights worked! After landing in Samoa with a whopping two hours to spare, "Mike was looking a bit ragged but I looked good," Alan laughed. "We went over our presentation one last time, trying to get into the mind-set as to how a true Samoan would give the presentation." Everyone at the meeting studied the 20-page proposal that Mike and Alan finalized on their midnight flight from Honolulu. "The Samoans do things with a great deal of trust and understanding of the people involved," Mike stated. "Because of our due diligence, we knew that providing a detailed legal agreement might have actually worked against us. So, the clincher was more about the fact that we came across as sincere and honest." "We needed to give them reasons to trust us," Mike continued. "I believe we did just that." A visit to the King's home helped cement a relationship they hoped would become long-term. "He was a kind, gentle person, concerned that what we wanted to do was in the best interest of his people," Alan said. The meetings ended on a congenial note with Mike and Alan satisfied that they had successfully completed the task they had set out to accomplish. Since their flight was not leaving the island for a few days, they went into vacation mode, spending time exploring Samoa's beautiful, pristine beaches and lush tropical forests. Convinced that negotiations had been concluded, Mike and Alan flew back to the States confident that the deal was completed. Unfortunately, they waited another few months to discover that their proposal had, in fact, been rejected. It seems that after making their presentation, no less than a half dozen companies from the United States and other countries were also granted an opportunity to offer presentations to the Samoan government. 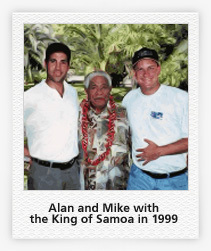 So much time had passed since Mike and Alan's initial visit, that it seemed inevitable the Samoans might have been deluged with other information, including various claims of potential profits by other groups wanting to do a similar deal. "I wanted to give up," Alan said. "I felt we had given it our best shot, but it just wasn't meant to be." Mike, however, had another idea. He tracked down the local Samoan government's majority- owned technology company that was ultimately granted the domain contract, and placed a call to its General Manager. "The company was local on the island, so I had a hunch that their ability to market the domains globally would be limited," said Mike. "I had to change my way of thinking. So, I pitched him on the idea that we should partner together, and he accepted."